WORK FROM HOME – A VERY POPULAR AND LUCRATIVE NICHE! Thousands of people worldwide are looking for a way to work from home, making this one of the most lucrative niches around. These articles can be used on your own blog or website or can be rewritten and then submitted to article directories. If you are in the ‘Work from Home’ niche then these are the articles you need for your business. These articles range between 400 and 900 words each. 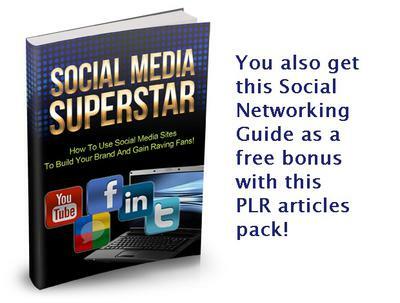 You will also get a free bonus copy of the “Social Media Superstar” PLR book that you can use to give away to build your lists, or to sell for a profit.